The cage and apartment simulators and the stress test room are used for SCBA training as well as in basic instruction of smoke diving technique and student testing. The apartment simulator has been built with wire mesh walls and resembles a normal two floor residence. In the simulator, students can complete e.g. search and rescue exercises in conditions with no visibility as part of basic instruction in smoke diving techniques. The apartment’s walls can be adjusted and dolls, that represent real people who need to be rescued and which are the same weight as humans, can be placed in the apartment. Trainers can monitor and evaluate the students’ performance from a separate control room with the help of infrared lights and cameras. 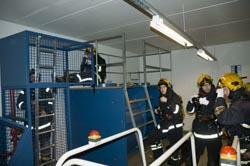 In the same way as the apartment fire simulator, the cage fire simulator is built with wire mesh walls from which a three-floor-track has been formed. The track includes different types of hatches and other obstacles that students must overcome as they progress along it. 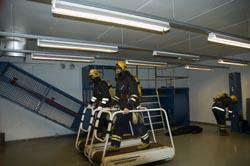 The track is used primarily for SCBA training. The physical stress test room includes various devices, which are used during training and testing to simulate the physical exertion firefighters may experience during their work assignments.